Do you need residential or commercial insulation services in Norfolk, Virginia Beach, Newport News or surrounding areas? The first thing most people are concerned with when considering insulation is how much it will cost. At Tidewater Insulators, we offer free insulation estimates to homeowners, builders and contractors for residential and commercial projects. 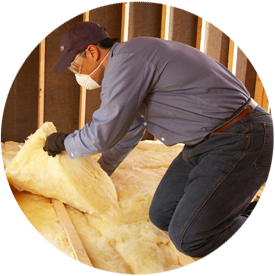 Contact us online to schedule insulation services or call us at 757-828-0024! The average reported cost (based on more than 34 profiles) of blown-in insulation is $1,718. The average reported cost (based on more than 25 profiles) of batt, roll and reflective insulation is $1,700. These costs may not necessarily be accurate for your project. Price will vary according to the size of your space, the material used, cost of supplies and labor, etc. There may also be incentives or rebates available that can affect the price. It’s always helpful to request an estimate before beginning your insulation project. Fiberglass can be one of the most cost-effective types of insulation and is available as blown-in (loose-fill) or rolls and batts. Cellulose, which consists of more than 80 percent recycled material, can be considered an environmentally friendly product. In our opinion, it is superior at stopping air infiltration. Spray foam is a great type of insulation to use if you need to fill cracks, gaps, crevices or any other small cavity. Thinking of insulating your new home or re-insulating your attic, walls or crawl spaces? Tidewater Insulators can help you maximize your energy savings and the overall comfort of your home. Schedule a FREE estimate with Tidewater Insulators to find out how much your insulation project will cost in Norfolk, Virginia Beach, Newport News and surrounding areas. Contact us today to get started right away!